We are getting a few queries from our agricultural clients about entitlement transfers and the Defra's October deadline, and in particular about the consequences of not transferring by then. The Q&A below might help. 1. Why is there an October deadline instead of the usual 2nd April deadline? This is purely a question of practicality. The Rural Payments Agency needs to 'convert' Single Payment Scheme entitlements to Basic Payment Scheme entitlements and will take the transfer system off line to do that. On 1st January 2015 you will hold the same number of BPS entitlements as you had SPS entitlements on 31st December. The transfer window will open again at some point from mid-January onwards; the exact date will be confirmed by the RPA later this year. 2. Is there any advantage to transferring SPS entitlements now, ahead of the new year? From 1st January 2015, payment entitlements will only be transferred to those who qualify as an active farmer under the new scheme rules. That test does not apply to transfers that take place this year under the current SPS scheme. Apart from that small saving in bureaucracy, transferring now does not confer any great advantage; in order to be eligible for payment under the Basic Payment Scheme you will need to be an active farmer. Of course, farmers who are buying land or taking on Michaelmas tenancies may prefer to have the payment entitlements transferred to them now, at the time of the transaction rather than next year. 3. When exactly is the deadline? The deadline by which your RLE1 form must be received by the RPA is midnight on 21st October. (This date has been put back a couple of days from Defra's original 19th October deadline, as explained in the August CAP Reform update.) In line with current practice, the actual transfer will take place 6 weeks after the form is received. 4. What do I put down on the RLE1 form as the "effective date of transfer"? If you want the entitlements to be transferred under the current regime, the 3rd December must be the latest effective date of transfer in box B3 (b). That equates to 6 weeks from 21 October. 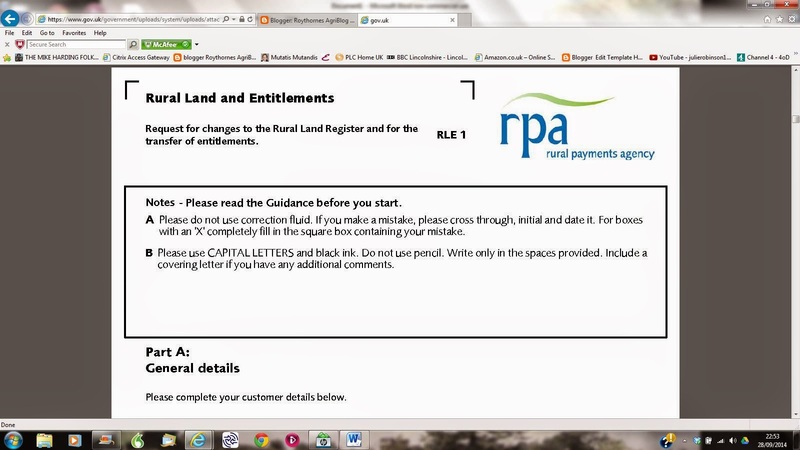 Alternatively, if you leave that box blank the RPA will complete the transfer 6 weeks after the form was submitted. 5. What happens if I miss the 21 October deadline or put an effective date of transfer that is after 3rd December? The entitlements will not be transferred. On 1st January 2015 you will hold an equivalent number of Basic Payment Scheme entitlements as you held SPS entitlements on 31st December. If you want to transfer those entitlements you will need to submit a transfer request using the new CAP Information Service. 6. What happens next year if I have more BPS entitlements than eligible hectares? You will lose your surplus entitlements. If you know you are going to have surplus entitlements, you may want to consider selling them, either now or in the new year once the transfer window re-opens. If you would like further advice about the implications of the new Basic Payment Scheme for your farming business, please get in touch with Julie Robinson (01775 842618).